One of my very talented friends planned a unique and fun one-year birthday party for her daughter, featuring vintage kitchen items. It all evolved around their hand-built gift for her, a kitchenette set upcycled from an old vanity desk. I got to design the invitations for her, complete with checkered gingham, vintage florals, and the sweetest reference to her name, Charlotte–which is actually a french dessert! There definitely was not a shortage of sweets! The main attraction (besides the pretty birthday girl) was a dessert buffet featuring pies. Decor featured garlands made from cupcake liners. I loved the handmade touches, like the yarn-wrapped letters that spelled “ONE” and the custom-made photo book that not only featured Charlotte’s photos of her first year but was also the guestbook where we could leave notes! Not to mention the amazing kitchenette that even featured a working oven light. What creative parents Charlotte has! And notice there’s no photos of the birthday girl–each time I tried, they were either out of focus or she was already out of the frame, just like every one-year old should be. 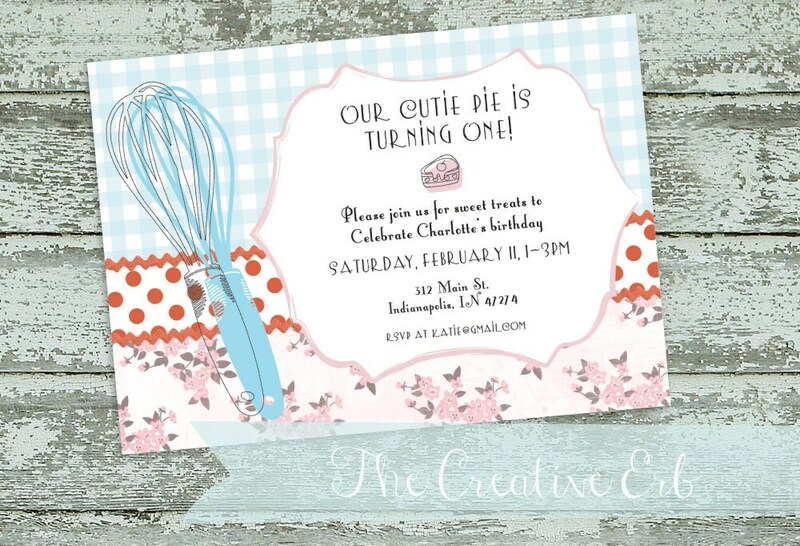 Custom Vintage Kitchen Invitations Now Available! Guess what? You can order your own baking-themed party invitations like the ones above on my Etsy Store.